NCAA Division I golf uses a split season, with several tournaments in the fall and the rest in the spring semester. This makes a lot of sense, not least of which because of the changing weather conditions the players face during both periods. The fall season ends in October, and with good reason. Grace Chua, a University of Delaware senior, watches her tee shot on the 19th hole (playing as the 9th) in the first round of the 2016 UD Fall Invitational, at Rehoboth Beach CC. 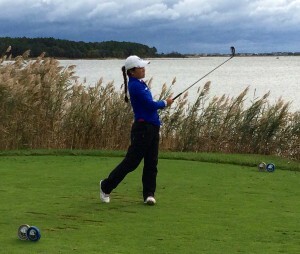 The ten participating college women’s golf teams at this year’s Fourth Annual Blue Hen Invitational, held Oct. 21-23 at Rehoboth Beach CC, experienced the Cape Region’s famously fickle fall conditions, and their scores reflected those challenges. Unfortunately, their best weather day was Friday, when the teams played their practice rounds at RBCC. During Saturday’s morning shotgun start for the first 18 holes of the 54-hole tournament, the golfers began with a steady rain, then were hit with increasing winds once the showers cleared. A chill in the air that wasn’t there 24 hours before made the second 18 holes on Saturday even more challenging. The club’s membership provided nearly thirty volunteers to help during the tournament, shuttling players to their starting tees, marshalling the course, and helping to find errant drives in the rough. Fortunately, the course was in good shape, well recovered from the flooding caused by Hurricane Mathew’s heavy rains. Conditions on Sunday for the final 18 holes were a bit warmer, but the golfers had to contend with a 20 to 25 knot wind coming out of the northwest, with occasional gusts going well above that average. 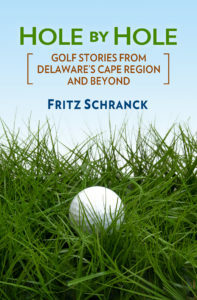 Rehoboth Bay was covered with whitecaps, and the clubhouse did not shield the 19th hole hard by the Bay (playing as the 9th for the tournament) from the winds that blew hard left. One young golfer told me that she hits a draw, and was so scared of going into the water that she aimed 20 yards right of the green. Her ball landed on the green hole high about 10 feet right of the hole, bounced left, and stopped in the fringe left of the hole. She made a nice par from there. From what I observed of several groups playing the 19th Sunday morning, her score was probably a minimum full stroke better than the field average. Harvard College won the team competition, led by Anna Zhou’s 10 over par medalist performance. The University of Delaware’s Vitoria Teixeira tied with Rutgers University’s Ashleigh Greenham for second place, at 15 over. Harvard’s Anne Cheng and Michelle Xie tied with Seton Hall’s Cassie Pantelas for fourth place at 16 over, with Delaware’s Ariane Klotz taking sole possession of seventh place one stroke back. Christina Park of the University of Pennsylvania finished in eighth place at 18 over, while Julia Calbi of Dartmouth College tied with Sophia Chen of Penn for 9th place at 19 over par. The final team standings and stroke totals were as follows: 1. Harvard University (920); 2. University of Delaware (930); 3. University of Pennsylvania (932); 4. Seton Hall University (942); 5. Rutgers University (944); 6. Towson University (954); 7. Dartmouth College (959); 8. High Point University (969); 9. Delaware State University (1111); and 10. LaSalle University (1286). Last year’s Lady Blue Hens won the Colonial Athletic Association conference championship, qualifying the team for the NCAA regional in Bryan, Texas. The team won the Rutgers Invitational in mid-September, and played well in the other fall tournaments. This was the Blue Hens’ last event until the spring season. Congratulations to the George B. Simpson Men’s group at Epworth UMC for their successful golf outing fundraiser Oct. 15 at the American Classic Golf Course in Lewes. The tournament raised over $10,000 dollars to support three missions to help the needy and homeless in the Rehoboth community. The money will be go toward the church’s Food and Love Kitchen, the Good Samaritan Food Pantry, and the Immanuel Shelter. In 2015, these missions provided over 3,900 meals to the needy, served over 700 community members with food, household goods and personal hygiene items, and provided food and shelter to over 130 homeless individuals.